“If you already spend so much on your sneakers, why not spend a little more to upkeep them?” said Callista Devi, a student from Kaplan University. A little more may even be an understatement because she admits to spending hundreds of dollars monthly on maintenance. 18-year-old Callista Devi is a fan of ‘regular checkups’ for her shoes. She is a huge sneaker head and is just one of the many customers who regularly gets her sneakers maintained and cleaned at Shoelution. Sneaker maintenance is a habit that is constantly evolving, especially with various types of sneakers being introduced yearly. 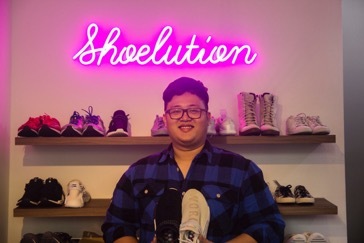 “Personally, I used to feel that this was a culture, many Singaporean youths do not practice, because many of them prefer the slightly dirty aesthetic” recounts founder of Shoelution Aaron Tan, 23. Regarding professional cleaning, “If a customer chooses to send their sneakers for cleaning, the whole process will take around 3 days” said Mr Tan. On the first day, the staff will begin by removing easy stains on the shoe with their own home-made pre-stain remover. This sets up the second day of cleaning, whereby the staff begin to thoroughly clean the shoes with their own cleaning solution. The third and final day will be set aside for water proofing (a layer of coating over the shoe to prevent water from ruining the layer of protection) and drying of the shoes. However, regularly sending sneakers for cleaning may take on a toll on your wallet in the long run. Fret not, because one can always adopt a more personal touch by cleaning your sneakers on your own. This method is exactly what polytechnic student Shang Ji adopts. 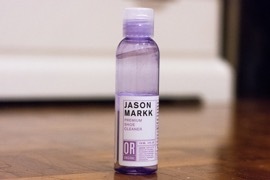 He uses Jason Markk Premium Shoe Cleaner to clean his leather sneakers. It is ideal for cleaning leather based shoes, and on top of all, leaves a fresh linen smell on them.